Are Mushrooms Very Healthy to Eat? Morel mushrooms have a distinctive brainlike appearance and a nutty, bold flavor. It's smart to use caution when choosing what to eat while you're pregnant, and the good news is that you don't have to give up morel mushrooms. They are safe as long as they are cleaned and prepared correctly. Make sure you're eating true morels, however, because imposters might end up making you quite sick. While it can be tricky to determine if a mushroom you stumble upon the wild is safe to eat, you can rest assured that morels are fine for you to consume while you're pregnant. In fact, many people hunt for fresh morel mushrooms, and they are the safest variety to forage for, according to John Maybrier and Theresa Maybrier, authors of "Morel Hunting: How to Find, Preserve, Care for, and Prepare the Wild Mushrooms." You can also buy morel mushrooms in many large supermarkets and specialty stores, and preparing and cooking them is the key to safely eating them while pregnant. Morel mushrooms supply a variety of nutrients your unborn baby needs to develop normally. A 1-cup serving of morel mushrooms supplies 2 grams of protein, which promotes healthy growth of muscles and tissues. That same cup of morel mushrooms supplies about 8 milligrams of iron, as well. That's 30 percent of the 27 milligrams of iron you need each day during pregnancy to reduce your risk of preterm delivery and your baby's risk of low birth weight. Morel mushrooms deliver 3.4 micrograms of vitamin D per cup, which is 68 percent of the 5 micrograms you need each day during your pregnancy. Vitamin D supports the normal formation of your baby's teeth and bones. 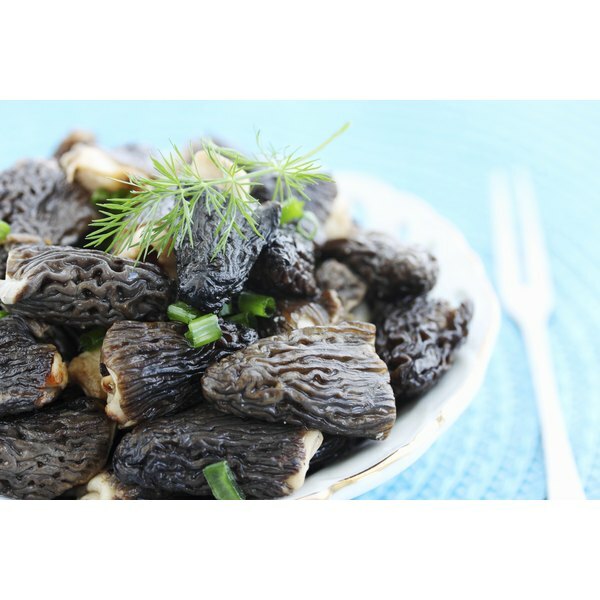 Morel mushrooms supply potassium, zinc and niacin, as well. Morel mushrooms must be prepared correctly. Cleaning the mushrooms is the first step. Use a small bristle brush and gently whisk any dirt out of the crevices of the mushrooms and then submerge them in a water bath to loosen any additional dirt and get rid of any bugs. Proper cooking is essential, especially if you're pregnant. In addition to being hard to digest, undercooked morel mushrooms can harbor bacteria that could make you sick. You can saute morels in oil or butter and eat them plain or precook them and add them to recipes. If you've never eaten morels before, ensure that you don't have a reaction to the mushrooms by eating a small bite and then waiting 24 hours before eating more. False morels exist and are potentially dangerous. False morels contain a toxin called gyromitrin, according to the Michigan Department of Community Health. Gyromitrin can cause nausea, vomiting, stomach pain, diarrhea, bloating, fatigue, muscle cramps and dizziness. In more severe cases, the toxin can cause liver damage. If you eat false morels and develop any of these symptoms, seek medical attention immediately. Undercooked true morel mushrooms can cause similar symptoms, so be sure to cook them properly, the Michigan Department of Community Health cautions. If you're ever in doubt, don't eat the mushrooms.